If you’ve got to work for a living, finding a job with people that you enjoy makes it easier. I lucked out at my job with Melinda, who is not only smart, energetic, and forever making me laugh, but also loves food and cooking. 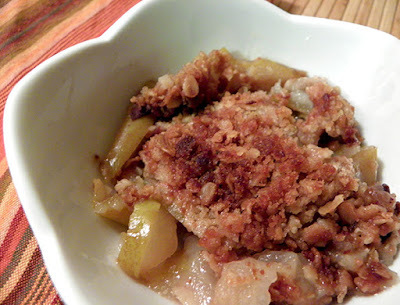 When her pear trees were in full fruit, she brought in a pan of pear crisp one morning, still warm from the oven. She said the recipe was reasonably healthy, and that she’d reduced the sugar. Unlike most crisps, it’s flavored with vanilla and nutmeg, not cinnamon. Originally “oatie peach crumble,” her tweaked recipe compliments pears perfectly. You can choose to peel the pears or not. 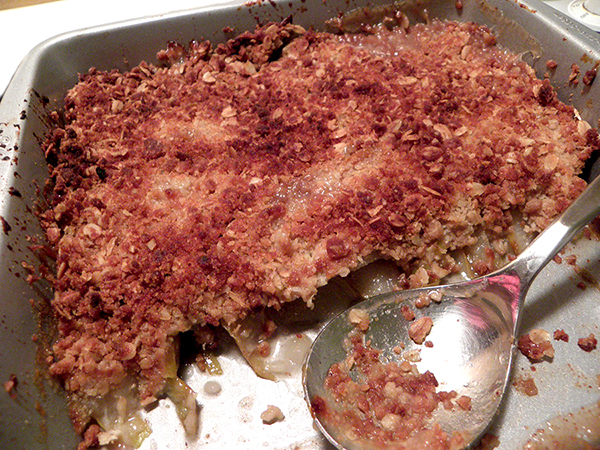 I used Honey Anjou pears from Camp Joy, characterized by both rough brown and smooth green skin. So I peeled off about half of the skin, or most of the rough brown spots. Use fairly firm pears that make distinct slices; avoid super-ripe, squishy ones. This recipe can easily be doubled, and in that case you might not need all of the topping. You can try leftover topping on mini fruit crisps by loading (for example) sliced apples in ramekins, and topping with the leftovers. Or broil it on top of baked butternut squash before serving. 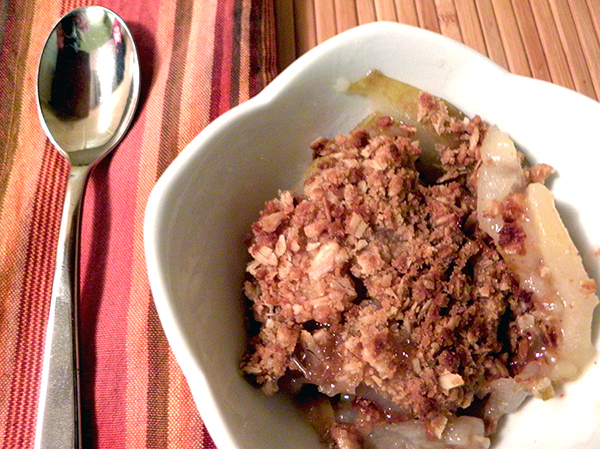 As hinted above, this recipe makes a lovely treat for coworkers. It’s a stress-free potluck contribution that is always appreciated. And of course, it’s a fragrant and iconic addition to the autumn menu at home. In a small mixing bowl, stir together rolled oats, flour, and dark brown sugar, breaking up any sugar lumps with your fingers or the spoon. 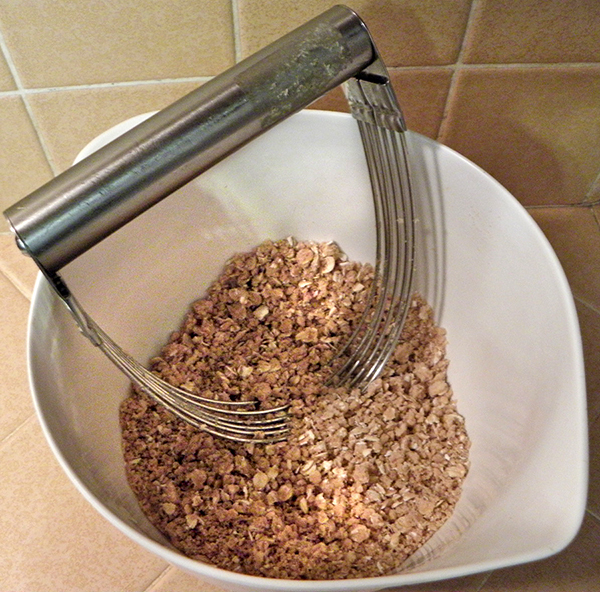 Cut butter into small pieces and add to oat mixture. Blend with pastry blender (or two forks) until the butter is distributed in small bits and the mixture looks like coarse breadcrumbs. Set aside. You may peel the pears or not, depending upon the pears and your preference. I like to peel half of them. Place pears in a large bowl, and toss lightly with lemon juice. Add white sugar, cornstarch, vanilla, and nutmeg. 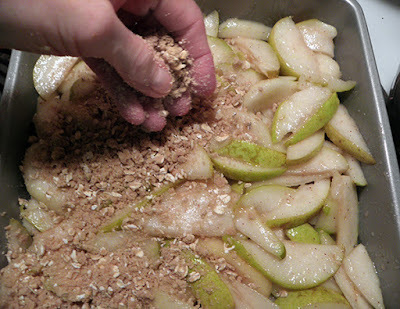 Toss gently until pears are evenly coated with mixture. 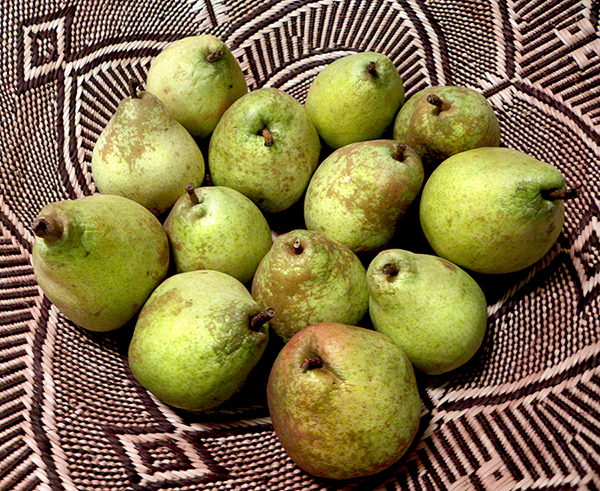 Turn pears into a 9” x 9” baking dish. Even the top by pressing down lightly on the pears and redistributing them as needed to form a flat-ish layer. 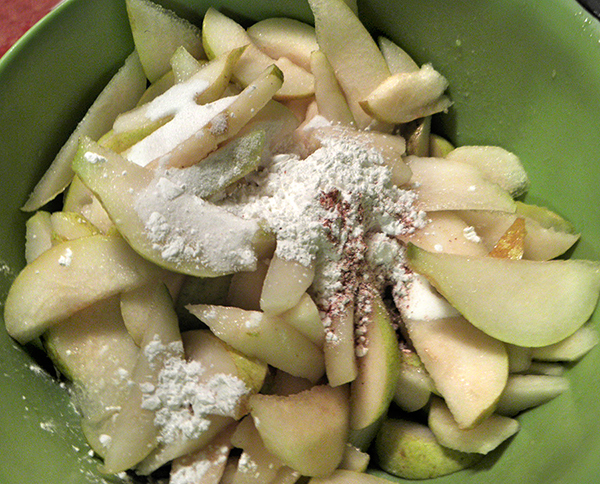 Sprinkle topping over pears evenly. Press down lightly if needed to even out top. Bake on the middle oven rack at 375 degrees until golden brown and bubbling, about 35 – 45 minutes. If top doesn’t appear brown enough, turn on the broiler and put baking pan on the top oven rack, watching constantly and removing when done, 5 minutes or less. Cool for 1 hour or more before serving.